Grumman XMMS-N-6 Rigel at launch. The Grumman Rigel was the earliest U.S. plan to develop a large submarine launched nuclear missile. 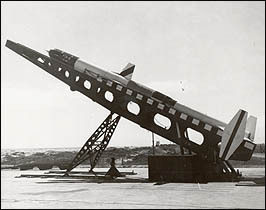 Although Rigel itself did not become operational, much was learned in the submarine and launching phase that was useful for the development of later missiles. Rigel was also Grumman's first missile project and led the company to expand its missile and spacecraft interests. 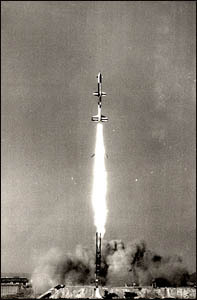 It was also the first successful American "ramjet" missile. Rigel had a solid-fuel first stage which boosted the missile to Mach 1 (the speed of sound), at which speed the ramjet kicked in and compressed air for the second stage which boosted the missile to Mach 2. Thirteen Rigels were successfully launched from California, between 1950 and 1953. This is the sole survivor.